A powerful Delta 4 rocket roared to life and climbed away from the Cape Canaveral Air Force Station Sunday evening on a high-priority mission to boost a National Reconnaissance Office spy satellite into orbit. Under a cloudy sky, the hydrogen-fueled engines in the three common core boosters of the United Launch Alliance Delta 4 ignited with a rush of orange fire at 5:58 p.m. EST (2258 GMT) and quickly throttled up to nearly 2 million pounds of thrust. Hold-down clamps then released and the huge rocket majestically climbed away from launch complex 37 atop a torrent of fiery exhaust. About 30 seconds later, it knifed into a deck of low clouds and disappeared from view. Because the NROL-32 payload is classified, United Launch Alliance halted commentary about seven minutes after liftoff, just after the protective nose cone fairing separated and fell away. The vehicle was performing normally at that point, but no other updates were expected. The payload is believed to be an electronic eavesdropping satellite with a huge collecting antenna. 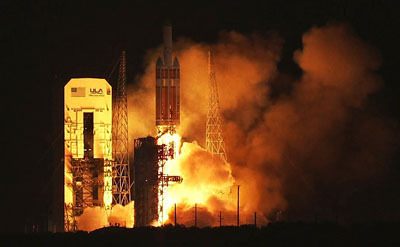 In a September address to the Air Force Association, NRO Director Bruce Carlson said the Delta 4 was carrying "the largest satellite in the world." "I believe the payload is the fifth in the series of what we call Mentor spacecraft, a.k.a. Advanced Orion, which gather signals intelligence from inclined geosynchronous orbits," Ted Molczan, a respected satellite tracker, told Spaceflight Now. "They are among the largest satellites ever deployed." Once on station, the satellite presumably will unfold a huge, lightweight antenna to tap into targeted military or civilian communications networks. "The satellite likely consists of sensitive radio receivers and an antenna generally believed to span up to 100 meters (328 feet) to gather electronic intelligence for the National Security Agency," Molczan told Spaceflight Now. ULA and the Air Force had hoped to launch the Delta 4 last Thursday, but the flight was delayed one day to replace suspect wiring in the system that releases the rocket from the launch pad. During fueling for a launch attempt Friday, unexpected temperature readings in the right and left common core boosters forced another delay. After extensive troubleshooting, engineers concluded two sensors were at fault. They were replaced and launch was reset for Sunday. This was the 351st Delta launch since the program's maiden flight in 1960, the 14th flight of a Delta 4 and the fourth mission by the most powerful Delta 4 "heavy" configuration.